OBSERVER Photo by Lisa Monacelli Brocton/Westfield’s Sophia DeMarco (5) attempts to block Fredonia's Anna Valone (14) in Tuesday’s varsity volleyball match at Fredonia High School. OBSERVER Photo by Lisa Monacelli Brocton/Westfield’s Sophia DeMarco (5) attempts to block Fredonia’s Anna Valone (14) in Tuesday’s varsity volleyball match at Fredonia High School. OBSERVER Photo by Lisa Monacelli Brocton/Westfield’s Abbi Warner (4) is met with a double block by Fredonia’s Sydney Bigelow (15) and Marissa Cash (8). 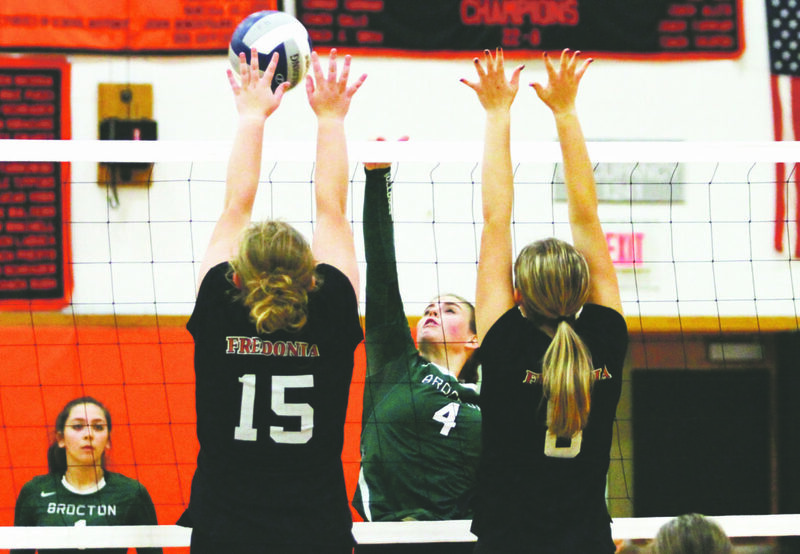 The Fredonia Hillbillies girls volleyball team was able to win on Tuesday, defeating Brocton/Westfield in three sets by scores of 25-17, 25-15 and 25-19. Fredonia was led by Nagley Vazquez who picked up seven aces, six kills and two blocks while Anna Valone picked up two aces, seven kills and eight digs to help the Hillbillies. Brocton/Westfield was led by Cheyanna Rivera with three aces, three kills and Sophia Demarco with one ace and five kills. Fredonia (2-1) will play again when it faces North Collins on Thursday at 6 p.m. Brocton/Westfield (0-5) will return to the court on Thursday as well when it hosts Dunkirk at 6:30 p.m. The Dunkirk Marauders volleyball team lost at home on Tuesday, losing in four sets to Forestville 16-25, 19-25, 25-21 and 20-25. Dunkirk was led by Jessica Beehler who had six assists, one kill and one ace. The Marauders also got contributions from Erick Fargas, who had six kills, two aces and two blocks, and Nadara O’Dell who pitched in five kills and three blocks. Forestville had a strong outing by Rhianna Nasal, who racked up 21 assists and contributed five kills. Rachael Goodrich also had a nice match for the Hornets, having five kills and nine aces. Moving forward, Dunkirk will need to focus on their coverages more. Dunkirk (1-3, 0-2) is back in action tonight when they face Jamestown. Forestville (1-2, 1-1) will host Silver Creek at 6 p.m. on Thursday. SILVER CREEK — The Silver Creek Black Knights girls volleyball team took a loss on Tuesday night, losing to Cassadaga Valley in three sets by scores of 25-18, 25-13 and 25-18. Cassadaga Valley was led by Kaitlyn Dahl with nine assists, two aces and Katrinah Bretl who had ten aces, five kills and five digs. Heidi Williams also contributed with five kills and two aces for the Lady Cougars. Silver Creek was led by Julia Hill with seven assists and Kierra Brennan with three kills and five digs. Madison Mott also contributed with three kills, three blocks and three digs. Silver Creek drops to 2-2 overall while carrying a league record of 1-2. Cassadaga Valley is now 3-1 with a 2-0 league record. The Black Knights will return to the court on Thursday when they travel to Forestville for a 6 p.m. start. 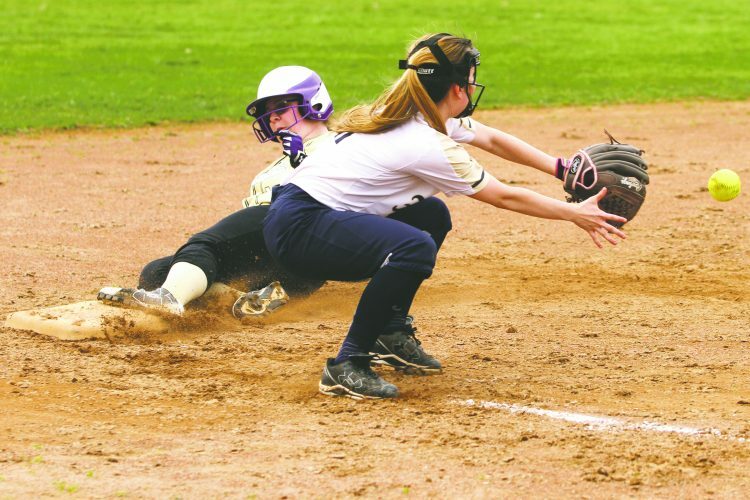 Cassadaga Valley will host Salamanca on Friday. 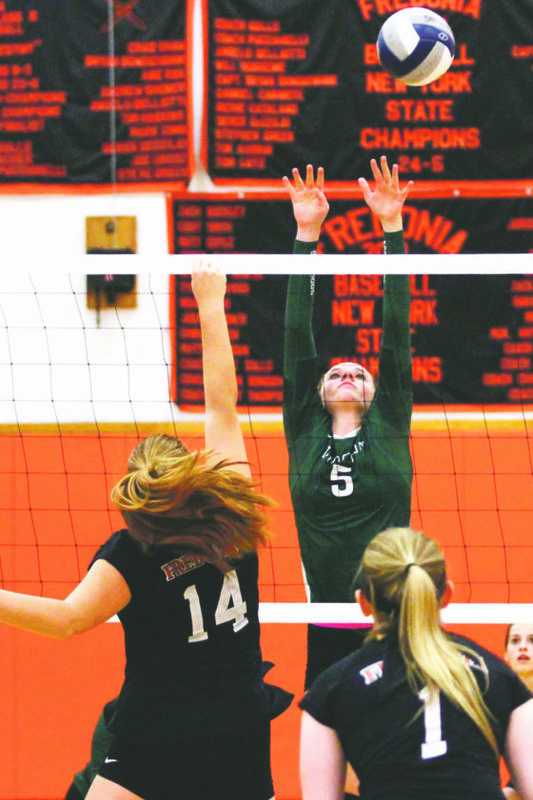 GOWANDA — North Collins came away with a win over Gowanda in straight sets, 25-20, 25-15, 25-22, on Tuesday in a varsity volleyball CCAA league match. Makenna Williams led North Collins (3-0) with 17 assists, along with a pair of digs. Baylee Romano had nine kills and four aces. Gowanda (3-1, 2-1) was led by Marleah Stevens with 11 digs and four kills. Summer Allen had 12 digs, 10 assists, five blocks and a pair of aces.